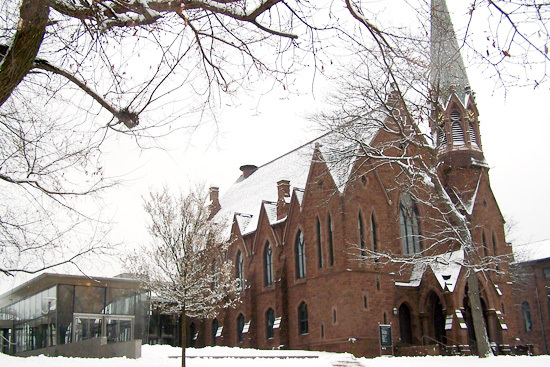 The Memorial Chapel will host several Spirituality Week events between Jan. 27 – Feb. 2. The 10th annual Spirituality Week will take place Jan. 27 to Feb. 2 at various locations on campus. Spiritually Week is coordinated by the University Chaplains each year to emphasize weekly religious and spiritual programs on campus and to sponsor and recognize special events. The chaplains regular events, such as the Catholic Mass, the Protestant Worship, Muslim prayer and a Jewish Shabbat will be held during this period. In addition, the chaplains have coordinated events with student-run organizations. Wesleyan Christian Fellowship is sponsoring an Athletes Fellowship to discuss the relationship between faith and life as a student-athlete. There will also be a discussion titled Jesus, Revolution and the Pursuit of Justice and two Bible studies. Wesleyan Dharma Study Group is sponsoring three Buddhist meditations. This years Faculty Panel will speak on Integrating Spirituality and Academics. Comstock expects more than 50 students and faculty to attend the discussion that includes a period for questions, posed by the audience. Jumu’a Friday Prayers, with Imam Mahan Mirza, Muslim chaplain. 12:45-1:15 p.m., 169 High Street, Room 210. Congregational prayer service with sermon (mmirza@wesleyan.edu). Shabbat, with Rabbi David Leipziger Teva, Jewish Chaplain. Services, 6 p.m.; Home-cooked Shabbat dinner, 7:30 p.m., Bayit, 157 Church Street (dleipziger@wesleyan.edu). Why Jesus? 7:30 p.m., Woodhead Lounge. Sponsored by Wesleyan Christian Fellowship. Discussion on ‘What makes Jesus unique among religious teachers?’ (cchow@wesleyan.edu). Middletown Friends Meeting, 10 a.m., Zelnick Pavilion (wholder@wesleyan.edu). Gallery Talk with Israeli artist Hagit Mogan, 2 p.m., Zilkha Gallery. Part of Women, Bodies, and Rituals conference (http://mteter.web.wesleyan.edu/Molgan.htm). We Refuse to Be Enemies: Jews, Christians, and Muslims for Peace, discussion with area scholars and activists who work together for peace. 3 to 6 p.m. Woodhead Lounge, dinner. Sponsored by Imam Mirza (mmirza@wesleyan.edu). Buddhist Meditation, 3 p.m., Mediation Room, lower level, Chapel. Sponsored by Wesleyan Dharma Study Group (glesser@wesleyan.edu). Catholic Mass, with Father Louis Manzo, Roman Catholic Chaplain. 9 p.m., Chapel. Meditate on Scripture and share the Eucharist; social/refreshments (lmanzo@wesleyan.edu). Martin Luther King Jr. Celebration, 4 p.m., Chapel. Sponsored by the Center for Community Partnerships (ccrimmins@wesleyan.edu). Protestant Worship, with Rev. Gary Comstock, Protestant Chaplain. 5:30 p.m., Chapel. Communion, Bible reflection, contemplation, prayer, supper (gcomstock@wesleyan.edu). Athletes Fellowship, 7 p.m., 43 Lawn Avenue. Sponsored by Wesleyan Christian Fellowship. Pizza and talk with Leah Kelly, assistant softball coach, about relationship between faith and life as student-athlete (ereding@wesleyan.edu). Volunteer at Soup Kitchen, 8 a.m., St. Vincent de Paul, 617 Main Street. Sponsored by Office of Community Services & Volunteerism and Chaplain Comstock. Let us know if youre coming and/or need a ride (ccrimmins@wesleyan.edu; gcomstock@wesleyan.edu). Queerness & Spirituality, noon, Chaplains Lounge, 169 High Street. Lunch and discussion led/co-sponsored by students and Chaplain Comstock (mmatthews@wesleyan/edu). Faculty Panel, Integrating Spirituality and Academics, 4:15 p.m.,Meeting Rooms 1/2, Campus Center. Food at 4 p.m. Moderator: Kulsoom Hasan 07. Participants include Maria Cruz-Saco, dean of the college and visiting scholar in economics; Ravishanker, director of Information Technology Services and adjunct associate professor of chemistry; Vera Schwarcz, Mansfield Freeman Professor of East Asian Studies and professor of history; Gina Ulysse, assistant professor of anthropology and African-American Studies; Greg Voth, assistant professor of physics. Rangoli: Sand Designs of India, 5:30 p.m., Zelnick Pavilion. Learn about and participate in making what are called painted prayers in the Hindu tradition. Led by students and co-sponsored with Chaplain Comstock (mbery@wesleyan.edu). Buddhist Meditation, 7:30 p.m., Buddhist House, 356 Washington Street. Sponsored by Wesleyan Dharma Study Group (glesser@wesleyan.edu). Bible studies. Sponsored by Wesleyan Christian Fellowship. Freshman Bible Study, 8 p.m., Butterfield C Lounge (jychan@wesleyan.edu). Womens Bible Study, 8 p.m., AAA House, 107 High Street (vlew@wesleyan.edu). Mens Bible Study, 9:00 p.m., 14B Warren Street (csamsen@wesleyan.edu). Making a Day-by-Day Spiritual Guide, 4:15 p.m., Chaplains Lounge, 169 High Street. Learn about and get involved in this new project. Snacks. Sponsored by students and Chaplain Comstock (hjackson@wesleyan.edu; gcomstock@wesleyan.edu). Vespers, with Chaplain Comstock, 5:30 p.m., Chapel. A different ritual/activity each week for students of any or no religious affiliation. Vegetarian meal (gcomstock@wesleyan.edu). Jesus, Revolution, and the Pursuit of Justice, 7:30 p.m., Chapel. Sponsored by Wesleyan Christian Fellowship. Mako Nagasawa, speaker (lallison@wesleyan.edu). Co-Ed Bible Study, 8 p.m., 43 Fountain Avenue. Sponsored by Wesleyan Christian Fellowship (gvoth@wesleyan.edu).